Floor Space 80" (2032 mm): 14 ft. x 12 ft. In order to meet excellent quality standards, we are offering Surface Winding Slitting Machine. With the involvement of modish technology, latest machinery and advanced tools in all our processes, we are occupied in offering Surface Winding Slitting Machine. With sincerity and hard work of our experts, we have carved a niche for Surface Winding Slitting Machine. We offer an exclusive range of technologically advanced Slitting Machines, which serve their purpose in the packaging industry. Our products have unique properties with respect to innovative designs that include a tension controller, electric converter transducer and imported blade group. 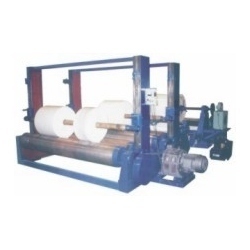 We offer Surface Winding Slitting Machine.